Do you like traveling like me Or Is traveling is your hobby ? But you always worry about tickets and hotel expenses. Then this post is specially for you ! Today I'm going to share one exiting offer with you. With which you'll be able to book hotels for free and not just the hotels but also Flights, Buses, Trains Tickets for free. You'll get Instant 500 Rs/- GoCash and a chance to increase the GoCash by doing a bit of the hard work. Don't panic if you're not traveling daily because the validity of GoCash is life time. 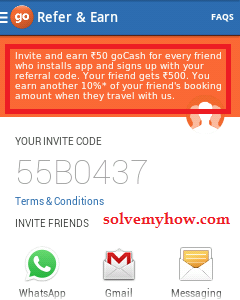 How to Get 500 Rs/- Instant GoCash from GoIbibo? 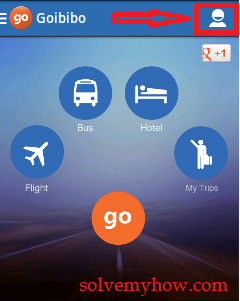 Step 1 :- Install GoIbibo App first ! Step 2 :- Register/Sign up by entering 55B0437 Referral Code ! Note :- If you register without entering the referral code. You won't get the 500 Rs/- GoCash. So, Please be careful while registering because you'll get only one chance per device. So, enter the code properly. It's 55B0437 (after B its zero not 0) ! Now, Just Click on Sign Up and you'll get 500 Rs/- Instant GoCash. In return GoIbibo will give me 50 Rs/- GoCash. But if you register without entering the referral code you'll get nothing. 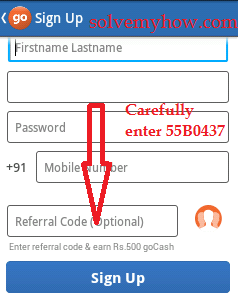 So, its better to register with the code (55B0437) and earn 500 Rs/- GoCash. After signing up with that code. Check your GoCash Balance. You'll be showing 500 Rs/- GoCash ! How to Earn More GoCash ? Share this code with your friends on Facebook, Whatsapp etc and on every successful Sign Up of app with your referral code. You'll get 50 Rs/- GoCash and als0 10% of your friend's ticket booking amount. Isn't that very cool and easy to earn GoCash and travel for free ! You'll get the "Invite Friends" option in "Refer and Earn". See the above snap shot and share it from there directly. Do let me know how much GoCash you earned by sharing you referral code and don't forget to Subscribe for our Newsletter to get the answer of every How into you INBOX !